Set up custom queries and generate custom stats. Brand your contact center's wallboard by adding your company's logo. Use a custom font and sound for your wallboard display. Click to add a new wallboard, or to edit an existing one. Display Name The custom field name that is displayed on the wallboard. Description A brief description of the metrics. Field Type Select a data type from a choice of Number, Seconds, and Percent. Note: The data type of the custom field must match the data type of deriving fields. Select from the available fields drop-down or enter a number value. Select an operator (-,+, -, *, or /). Select another field or enter a number value. Note: You can add any number of arguments. Within each media type, you can set up a custom threshold for each queue to suit your requirements. If the waiting time for an interaction in a queue exceeds two minutes, set up a first level threshold alert. If the time exceeds 3 minutes, set up an emergency alert. On breaching thresholds, the wallboard gives corresponding alerts. Set up a custom threshold with desired values and alerts. Apply this threshold to desired queues. 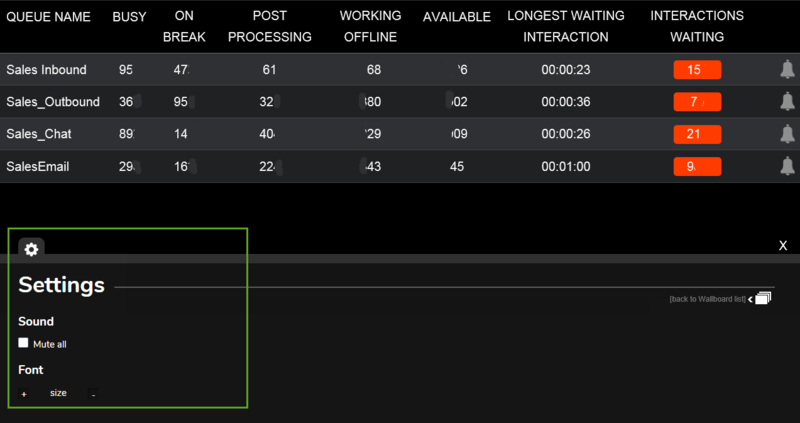 On running a wallboard with custom threshold, the alerts trigger on breaching the threshold for the selected queues. Click to edit the desired wallboard. Go to the Threshold tab. Enter a Name for your custom threshold. Click a Field Name, then specify a value in the parameters. Select a color from the color chart for Background Color. Select a Sound alert from the drop-down list. Add more fields as desired. Go to Wallboard > Queues. Select the custom threshold from the Threshold Option drop-down. Brand your contact center wallboard by adding your company logo. In the Tenant – Logo area, upload your company logo. You can control the font size of the wallboard display, or mute the audio alerts on your wallboard. Click the tools at the corner of the wallboard screen. Use + and – to increase or decrease the display font size. Select Mute all to mute the sound.